Yes, they spark and can start fires – but so can cigarettes and matches. Sparklers can also burn idiots who put them in their pants and then record themselves igniting their crotch. So, outlawing sparklers is really just denying the public the ability to make fiery circles with slow shutter speeds and experience schadenfreude at dumb people on YouTube. Most states allow consumer fireworks of some type. The exceptions are Delaware, Massachusetts and New Jersey. 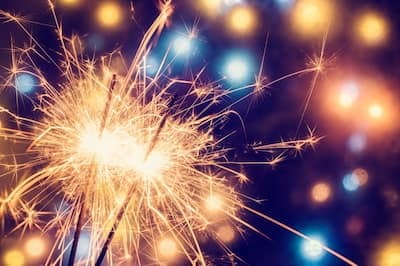 Only recently, in 2014, New York came off this list when it passed a law that allows sparklers, party poppers and cone fountains to be sold, possessed and lit up – but only if your local county government has opted in. New York State Troopers note that it’s a crime to provide a sparkler to a person under the age of 18. In Illinois, Iowa, Ohio and Vermont, you are only allowed to use wire or word sparklers and other novelty items. Ohio’s law allows consumer fireworks to be sold to Ohio residents, but only after signing an agreement that says the items will be taken out-of-state within 48 hours. In Nevada, a similar law required residents to take purchased fireworks out of the county within 24 hours. Even in states that allow more than a few novelty items can have strict rules on what can and cannot be purchased and during what time of year fireworks can be sold. For example, California specifically prohibits a long list of items, including firecrackers, skyrockets and roman candles, and only allows sales from noon, June 28 through noon, July 6. The American Pyrotechnics Association gives a state-by-state breakdown of firework laws. 0 Responses to "2. Sparklers"